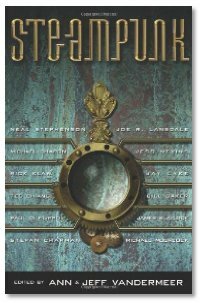 Stackpole mentions that Jeff and Ann Vandermeer have a steampunk anthology out there, and that might be a good place to start. regarding the narrow and tall paperbacks, I came across Jim Butcher's Small Favor in that format, and I actually decided not to buy it. If they don't put out a regular sized mmpb of it eventually, I'll go find a copy of the hardcover. I'd rather have the hardcover messing up my bookshelf symmetry than that oddball size! I prefer the standard trade pb size and the mmpb size, but not a hybrid of the two. I don't know why they are using that size... it doesn't seem to save bookstore shelf space; in fact, in some Borders I've been in, they'd have to adjust the shelf heights to accomodate a lot of those, resulting in fewer shelves per bookcase, I'd imagine. I recently found that as well. I thought, hmmm, new book? Was short but rather good I thought. Summer: That way lies madness. Trust me. I had to give up on bookshelf symmetry YEARS ago. Publishers are issuing new paperbacks in a bigger size for baby boomers who are finding it harder to read small type. I believe that the reason behind the "taller paperbacks" is simple--a higher price. A standard paperpack generally runs $7.99 retail...most of the "tall paperbacks" run $9.95 retail. I do suspect it was just a shameless marketing ploy to sneak a stealth price increase into the retail chain. Rather than bumping up "standard paperback" pricing and enduring the backlash, they created an "almost trade paperback" format, charging a higher price, and never release a standard paperback format at the standard lower price. By contrast (warning: shameless plug), my ebooks are just $1-2, simple HTML files you can read on almost any device and DRM-free so you can print, backup, and format shift as you desire. Author of the Outlaw Galaxy series and Star Wars: The Essential Guide to Vehicles and Vessels. Mark: I thought that's what the large type books were for! The print in this new hybrid format didn't seem to be larger, but I wasn't checking closely. I will have to go back and compare. Bill: I am not the only one willing to pay the $12.95-$14.95 for a regular trade paperback version, especially given that the tall paperback's a higher price than the mass market version. Arkle: I don't need complete bookshelf symmetry... just series symmetry. That really shouldn't be too much to ask for. I remember being bummed that I couldn't replace my original silver Elric series after they went missing, because at the time the entire series hadn't been reprinted in the newer white format. I wasn't about to have 3 silver ones and 3 white ones... that would have been crazy-making for me. So I had to wait another year before the entire series was out in the white covers. I agree, this might have been spun as an alternative to large type books for a specific demographic but in reality it has become what Bill suggested, a price increase. It will be interesting to see how this trend will play out.